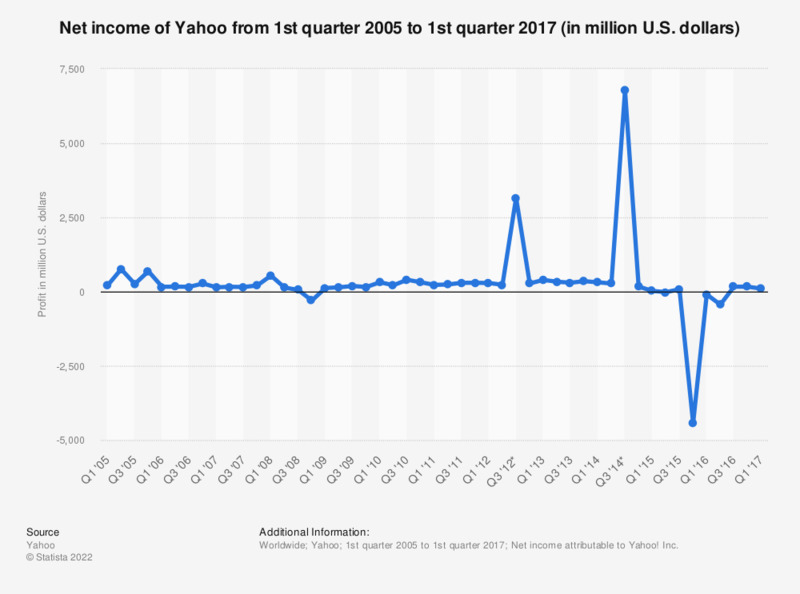 This statistic shows Yahoo's quarterly profit from the first quarter of 2005 to the first quarter of 2017. In the most recently reported quarter, the company generated a net income of 99 million U.S. dollars. The 6.77 billion dollar GAAP income in the third quarter of 2014 was strongly influenced by the company's sale of Alibaba shares. Yahoo's yearly net income in 2014 displays an almost six fold increase compared to the previous year. * Yahoo! 's Q3 2012 net GAAP income amounted to 3160 million U.S. dollars, this figure was strongly influenced by the company's 4.6 billion U.S. dollar sales of Alibaba shares. Q3 2012 GAAP income from operations amounted to 152 million U.S. dollars, a 14 percent loss from Q3 2011's 177 million U.S. dollars. Third quarter 2014 GAAP net earnings included a gain from sale of Alibaba Group Holding Limited ("Alibaba Group") shares.